This is the first recipe I’ve tried from TheFresh20.com, a site that provides a full week’s worth of meals and recipes, using 20 in-season fresh ingredients. It’s supposed to help you use up all that you buy, so that you don’t have any wasted food. 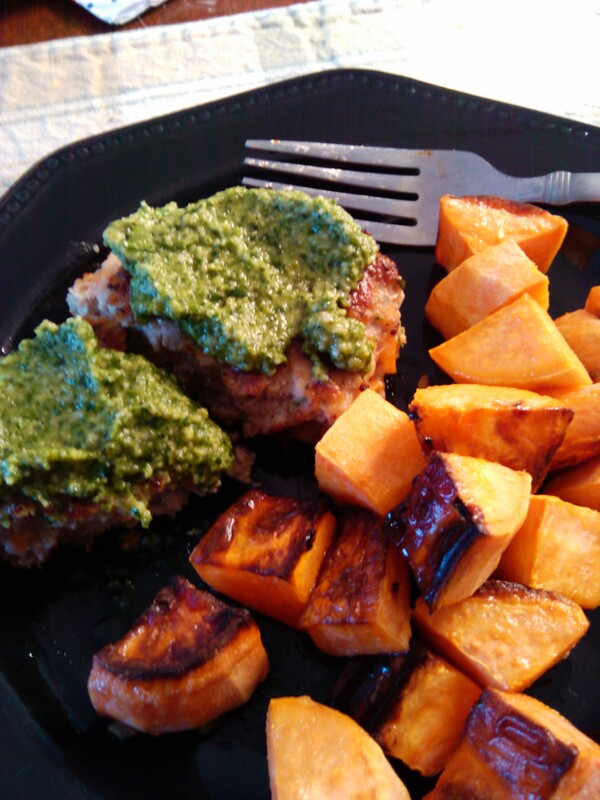 The chicken burgers had shredded onion, carrot & dijon in them (among other things), and the pesto was just right–tasty, and fresh. I love that there was lots of spinach in it. And, sweet potatoes were roasted with olive oil. Simple, and quick. Food: Oh so delicious macarons! 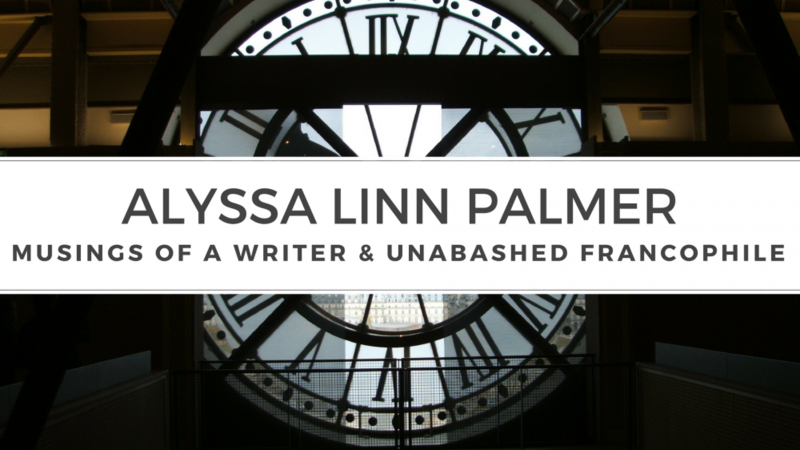 The other day I was checking out the site My French Life, and I came across a post on a stroll in Paris, which featured a photo of a box of macarons. Reading further, I found a post on the website CakeJournal and decided to try to make my own. Mix the icing sugar and almond flour together in a bowl. I used a whisk, but you can use a food processor too. It’s important to mix them thoroughly. Beat the eggs, and as they get foamy, start putting in the granulated sugar, 1 tablespoon at a time. Beat until the egg whites are glossy and stiff. Let the batter sit for one hour (yes, really–this was the hardest part for me, I wanted to get them baked! ), and then put them in an oven that has been preheated to 300˚F (150˚C) for 10-12 minutes. I found that 10 minutes was enough to make them hard and just a touch golden. I filled my macarons with chocolate ganache (I *love* chocolate), but you could use buttercream icing, or jam, or whatever else caught your fancy. Also, if you want to make your macarons chocolate, substitute a bit of cocoa powder in the dry mix. And don’t be afraid to experiment with colour dyes! But, my favourite part about this recipe, aside from how delicious it is? It’s gluten-free. I snagged this delicious recipe from the Epicurious site, one of my favourite places to go for new dishes. I made it as an appetizer for a larger family gathering, and it was enjoyed by many (though not all, as there were a couple of people who *really* were squicked by the caviar). I seared the scallops for about 4 mins (2mins per side, until beginning to brown), then let them cool to room temperature. I then laid them out on the serving dish and spooned crème fraîche over them. I was unlucky to get a container of crème fraîche that was a bit runnier than usual, hence the drips. Usually it’s about the consistency of sour cream. 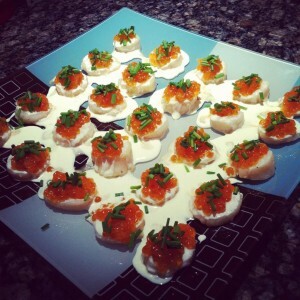 I used salmon caviar (bought at the local Russian delicatessen) and topped each scallop with a few finely chopped chives. They were a little bit messy so when you serve them you’ll need to put out side plates and forks. And, bonus? This recipe is gluten free. Food: Crêpes, my favourite breakfast. 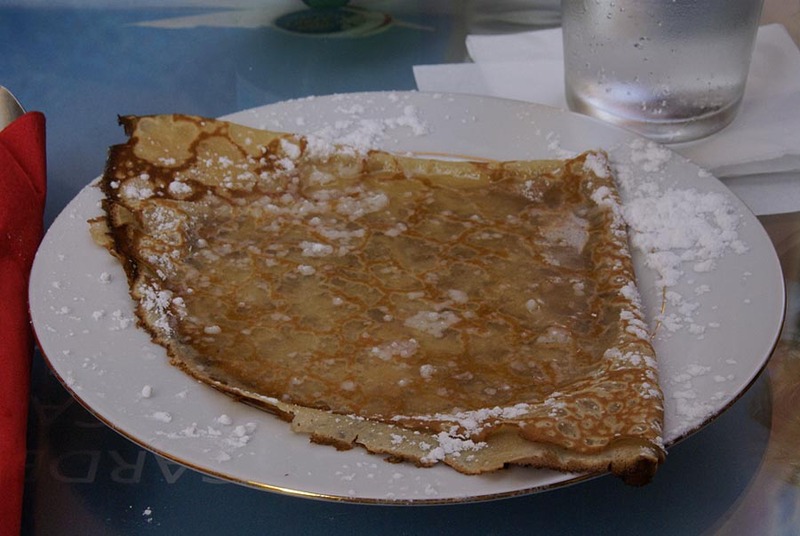 When I was in Paris, one of my favourite snacks was to grab a crêpe from a crêperie as we took in the sights. And crêpes go well with a bottle of apple cider, sitting on a terrace of a café in Montmartre. This meal turned out rather delicious, if I do say so myself. It was a riff off of this noodle dish from Gluten-Free Girl. I say a riff because I didn’t have toasted sesame oil, almond butter, cellophane noodles, or red cabbage. But, no matter! For the veg, take any veg you fancy (I used asparagus, corn, butternut squash and a few crimini mushrooms), and lightly steam. You could probably use them all fresh and raw too if you wanted, but I like them steamed a bit. 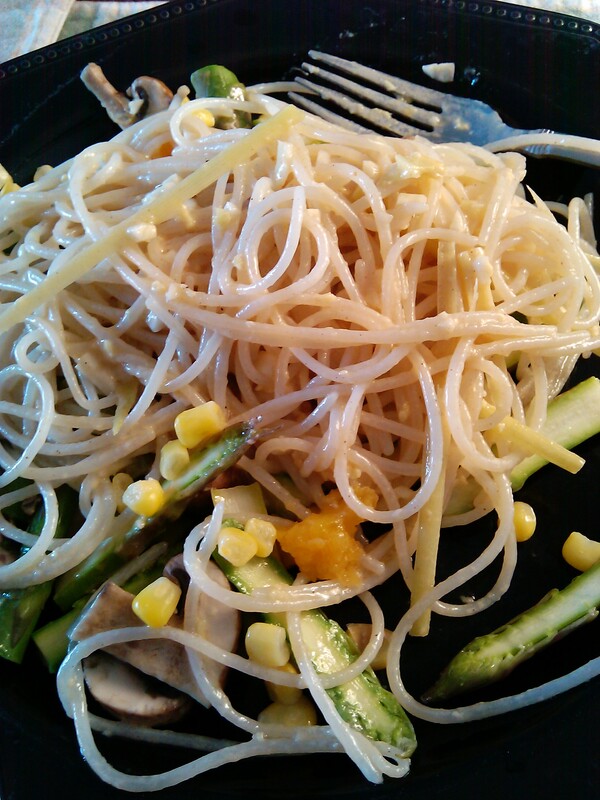 Cook the rice noodles, and drain. Toss the veg on a plate, the noodles in the bowl to coat with the sauce, then dump the noodles on the plate over the veg. Or, be a little fancier and plate it up all nice and pretty. Depends how hungry you are! A tip — do up the sauce to your taste. If you’re not that keen on vinegar, use a little less. Super keen on peanut/almond butter? Use more. If it seems too thick, add some more oil. I used two cloves of garlic, but that’s a bit zippy. Taste it as you go. The ginger and the rice vinegar make this dish, in my opinion. Easy peasy. Inspired by this excellent post and video by the Gluten-Free Girl (and the Chef) on how to poach an egg, I made this delectable salad for dinner. 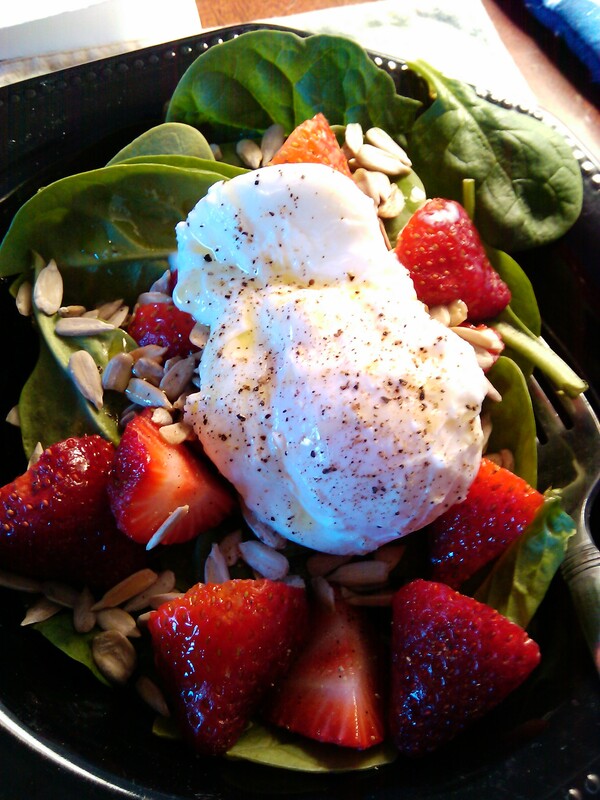 It’s so easy — watch the video, poach an egg, and set it on top of some spinach leaves, chopped strawberries, sunflower seeds, and drizzle with a bit of olive oil. It’s a perfect light dinner. If you want to make it a little fancier, add some grated Parmesan cheese, some tomatoes (they aren’t my thing), and perhaps some fresh basil. 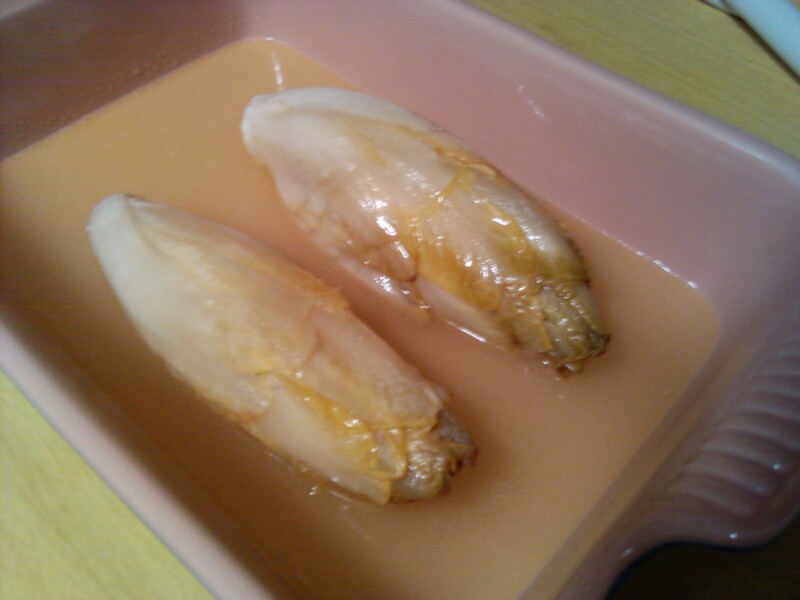 I don’t know if I’d even had an endive before I made this recipe for the first time. I’d seen endives at the grocery store and wondered what exactly they were and what they tasted like. They looked pretty healthy. I came across this recipe by Julia Child and decided I needed to give endives a try. This dish eliminates the bitter flavour that endives have, and the lemon and butter combination is very fresh. Endives ready for the oven. Preparing the endives: Trim the roots (but make sure the leaves stay intact) and remove any brown bits or wilted leaves. Wash under running water. Preheat the oven to 325 degrees F/162 degrees C. Arrange the endives in a stove and oven safe baking dish in a single layer. (Or, do as I did and use a non-stick saucepan with lid for the stove parts, and transfer into a baking dish for the oven parts.) Add the salt, butter, lemon juice and water to the dish/saucepan and simmer covered on the stove for about 20 minutes (or until tender). To ready for the oven, remove the lid and place a piece of parchment paper cut to size on top of the vegetables. Place into the preheated oven (you remembered to do that, right?) and bake for about 2 hours. Baste the endives several times during cooking (I basted every half an hour and turned them after an hour), and add more water to the dish if need be, as it should be about 1/4 inch deep. Taste the liquid in the dish and adjust the seasoning if necessary. Once the endives are a pale, golden colour, remove them from the oven. Discard the parchment paper, place into a serving dish, and garnish with parsley (if wanted). Serve and enjoy.